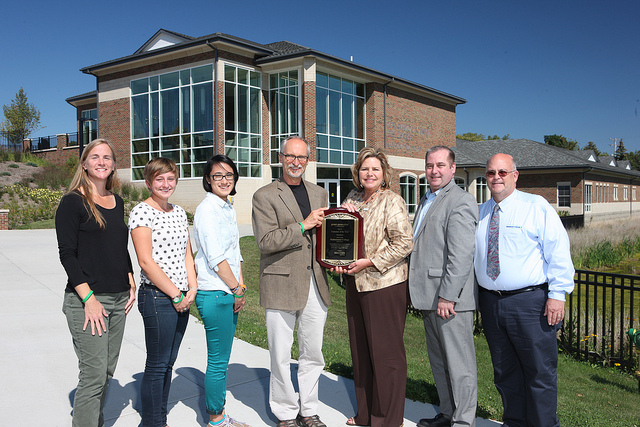 Consumers Energy names Kalamazoo College as its 2013 Green Generation Customer of the Year. The 1,450-student liberal arts and sciences college purchases 720,000 kilowatt-hours (KWh) of renewable energy annually from Consumers Energy, enough to supply 8 percent of the college’s total electrical use. Kalamazoo College has been a Green Generation participant since January 2009 and is among the top 10 all-time program participants. Past Green Generation customer of the year recipients are Irwin Seating, Grand Rapids Community College, University of Michigan – Flint, Dow Corning, City of Grand Rapids, and Wolverine Worldwide. Consumers Energy’s Green Generation program is available to residential and business electric customers and has nearly 17,000 participants. Launched in 2005, it was the first voluntary renewable energy program in Michigan. Green Generation has sparked development of several renewable energy projects in the state, including the Michigan Wind 1 park in the Thumb region. Other Green Generation projects include biomass facilities located near Birch Run, Lennon, and Marshall. Consumers Energy also purchases electricity for the program generated by wind turbines near Mackinaw City. All of the projects are located in Michigan’s Lower Peninsula and all sources are Green-e certified as renewable.